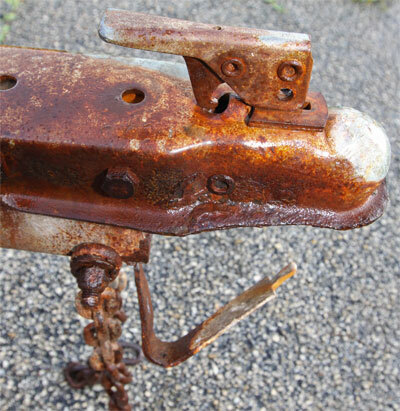 Whether you’re a novice angler or seasoned seaman you need to remember that corrosion doesn’t discriminate. Repeated immersion in saltwater, as well as wear and tear from highway driving, take their toll on boat trailers. While there are many uncertainties in boating one thing is for sure; without the proper preventative maintenance and care your trailer will die a slow and painful death. As an integral part of your essential equipment, it’s likely your boat trailer doesn’t receive as much attention as it should. Remember that when continual care and preventative maintenance are ignored, you’re essentially neglecting the safety of your boat, tow vehicle, and most importantly the safety of your passengers. Like any piece of equipment that is exposed to the harsh saltwater environment, you must wash your trailer after every use. I doubt you would ever neglect to wash your boat after a long day on the water, so why not care for your trailer the same way. Be sure to pay extra attention to the trailer’s leaf springs, wheel hubs, winch, and tongue jack. If your trailer is equipped with brakes and a flush kit you should definitely take the time to complete this simple and easy process that will, no doubt, save you time and money in the long run. While your boat may seem like the most essential piece to the angling puzzle, without a functional trailer your boat, tackle and gear will be rendered useless. Rinsing alone likely won’t be enough to thwart the harsh effects of problematic saltwater contaminants. You probably already use a corrosion combative spray like Corrosion X, CRC 6-56, or Nanotech 365 on your boat so why not put it to good use on your trailer as well. Be sure to thoroughly coat all moving parts including the leaf springs, bolts, hitch, wheel hubs, tongue jack and winch gears. 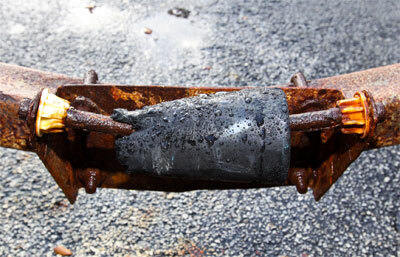 Remember that corrosion is like a disease – left untreated it will spread rapidly. Trailer lights may very well provide the most grief for trailer-boaters and driving without these essential safety features is a definite hazard, as well as an invitation for your local constabulary to write you a hefty fine. Trailer lights are highly unreliable, but this should come as no surprise because anytime you submerge an electrical component into saltwater you’ll probably have to deal with corrosion-related issues. 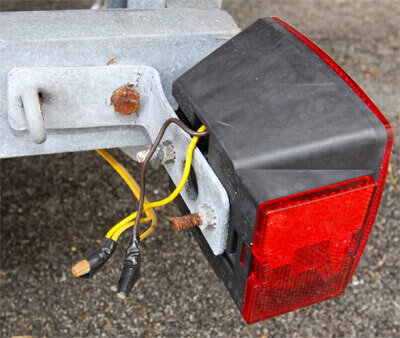 Trailer light failures are often a result of corroded light sockets, damaged wires, poor connections and improper waterproofing. When you are eventually faced with the tough task of diagnosing an electrical issue start by making sure all of the connection are tight, clean and properly secured. Trailer bearings and hubs demand continual care and service. 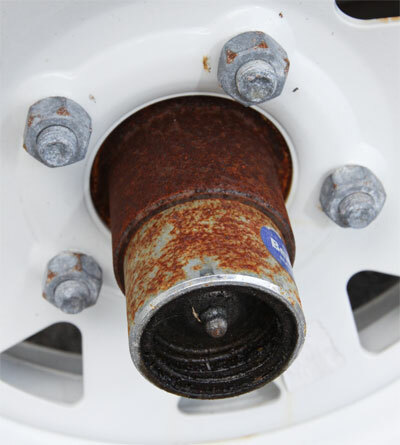 When it comes to trailer corrosion, it is here that you will likely notice the first stages of intrusion. The main issue is that when a trailer is backed into the water, the bearings and hubs that were recently heated from highway travel will suddenly be cooled. This will contract the hub, effectively trapping air inside and creating a vacuum that initiates saltwater invasion. 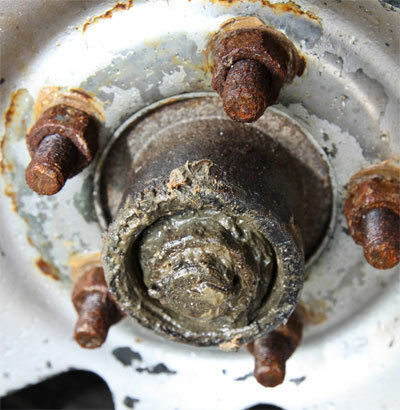 To prevent the corrosion of your trailer’s most important features, it is highly suggested that your bearings are greased on a regular basis and your hubs repacked no less than once a year. Bearing protectors, such as Bearing Buddy (www.bearingbuddy.com) help protect you bearings and hubs by keeping the dust caps full of grease. However, don’t think for one second that the addition of a bearing protector will rid you of your maintenance duties. Properly inflated tires will ensure the well being of your vessel and its passengers while simultaneously providing a smooth and comfortable ride. 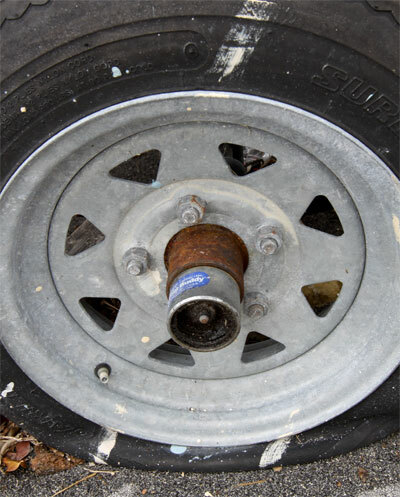 Without routine inspection trailer tires will not wear properly, which will greatly shorten their lifespan. If you notice wear in the middle of your tire it’s likely that it is over-inflated, while wear on the outside indicates under-inflation. It is imperative that your tires are inflated to the manufacturers recommended PSI, which can be found on the outside of the tire wall. Sin #6 – Who Needs Brakes? Florida law states that combined boat and trailer weights over 3,000-pounds require the use of brakes on all axles. If you fall into this category than you have yet another trailer component that is both essential for safe travel, yet highly susceptible to corrosion. Most trailers are equipped with surge brakes due to their cost saving attributes and the fact that electronic brakes don’t hold up well against saltwater. Whether your trailer is outfitted with disc or drum components you must care for your brakes like you would your boat’s motor. Drum brakes should be matched with a flush-kit, while disc brakes can be thoroughly rinsed with a freshwater hose. Trailer brakes are often neglected until a serious issue arises and just like your car, your trailer’s brakes deserve a professional inspection at least once a year.